Run Away With You Top https://www.review-australia.com/au/run-away-with-you-top-cream/RE19TW064.RECRM001.html Add a touch of elegance to your basics with this Run Away With You top. The fitted design creates a sleek look, whilst the one shoulder ruffle takes the piece from simple to sophisticated. Lined with satin and fitted with a hidden side zip for a seamless finish. Worn with Into You Skirt and Darcy Heels. Add a touch of elegance to your basics with this Run Away With You top. 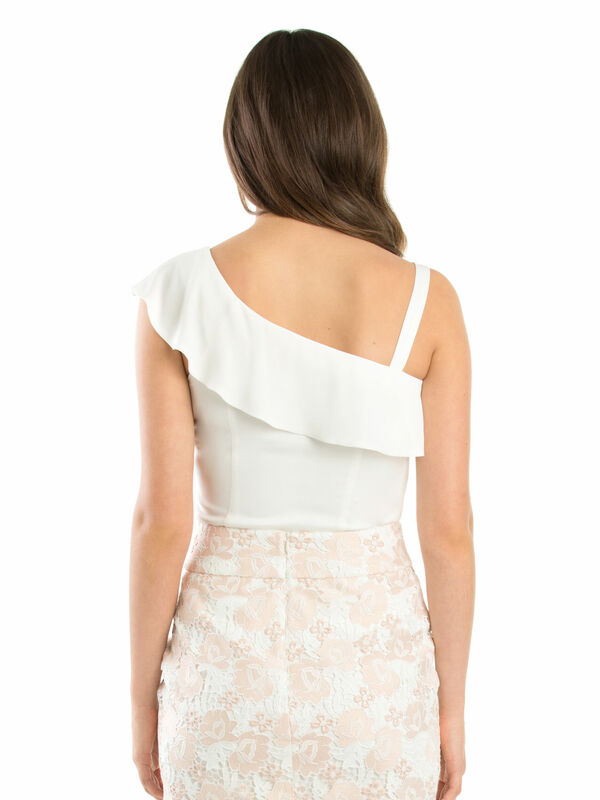 The fitted design creates a sleek look, whilst the one shoulder ruffle takes the piece from simple to sophisticated. Lined with satin and fitted with a hidden side zip for a seamless finish. Run Away With You Top is rated 4.8 out of 5 by 5. Rated 5 out of 5 by Leianahrose from Prefect fitting I brought this skirt for my daughters christening and it was perfect. It fitted my body perfectly and the design was beautiful. A lot of people asked me where i got it from and I told them to go to review as its an amazing store. Highly recommend this skirt for any occasion. Rated 4 out of 5 by Keerahh from Pleasantly Surprised I wasn't sure that this top would suit my shape (being a size 14) but it actually hugs and fits perfectly in all the right places. The shoulder strap is a little long, but other than that, a lovely, flattering elegant top to add to my collection. Rated 5 out of 5 by sally27 from Beautiful top! I bought this top a couple of weeks ago and have already worn it lots. Love it! Rated 5 out of 5 by Bec1 from Stylish Love the fit. Very stylish and feminine with side frill.